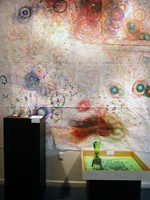 Drawbot – 2001 | JONAH BRUCKER-COHEN, PH.D. Drawbot – 2001 – JONAH BRUCKER-COHEN, PH.D. 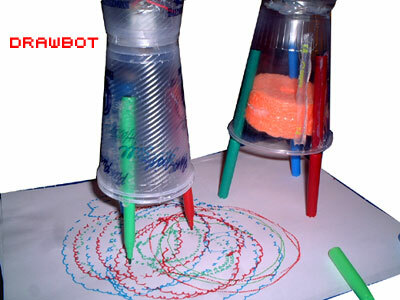 If you are interested in using Drawbots in an educational setting, please contact me directly first. 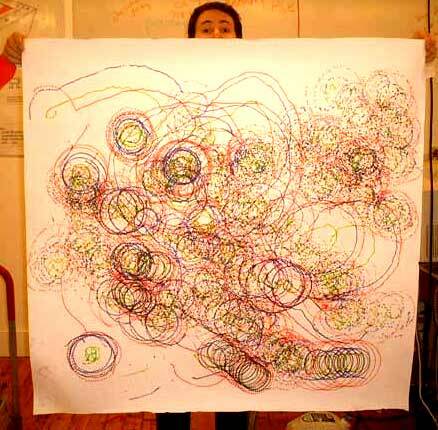 Drawbot is a drawing system that anyone can use without having to learn electronics. 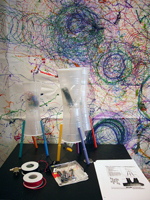 It is a simple bot that mixes standard drawing materials (in this case magic markers) with weighted motors and plastic cups. When the cups vibrate, they draw circles and lines depending on their overall weight and power. The project teaches programming to kids through physical means or “Physical Programming”. 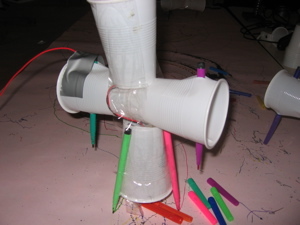 By adjusting the weight distribution of materials in the cups, the bots draw different patterns on the paper and are thus changed through simple forms of augmentation. June 17, 2016, Brooklyn, NY. June 6, 2015, Brooklyn, NY. April 14, 2014, NY, NY. September 29, 2013, Brooklyn, NY. July 7, 2012, Palaiseau, France. May 31, 2012, Beijing, China. October 27-28, 2011, Cincinatti, Ohio, USA. September 24, 2011, Brooklyn, NY, USA. October 2, 2010, New York Hall of Science, NY, NY, USA. September 25-26, 2010, New York Hall of Science, NY, NY, USA. March 13 – 14, 2010, Newcastle, UK. January 28, 2010, The Skiff, Brighton, UK. organized by Damien Robinson, held at Theatre Resource, May 25, 2009, Great Stony, Essex, UK. Horizon Scotland, Forres, Scotland, UK. BT Young Scientist and Technology Exhibition, (Discover Science and Engineering Stand), January 9-13, 2007, Royal Dublin Society, Ballsbridge, Dublin, Ireland. Drawbot Workshop at ANAT New Media Lab, 10/1-15/05, Melbourne, Australia. DrawBot Workshop @ The Ark, 8/11-13/04, Dublin, Ireland. 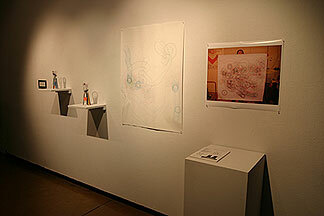 Simple.Tech, 2/10/04 – 3/5/04 @ Sheppard Fine Arts Gallery, Reno, Nevada, USA. 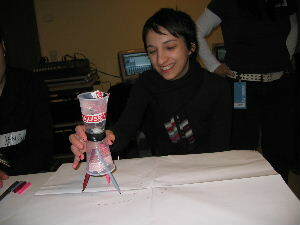 Drawbot Workshop at Transmediale.04, 1/23/04, Berlin, Germany. Drawbot Workshop at DATA:BASE, 4/26/03, Dublin, Ireland. 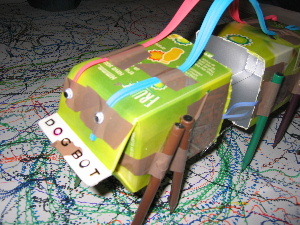 The prototype for Drawbot consists of cheap materials. 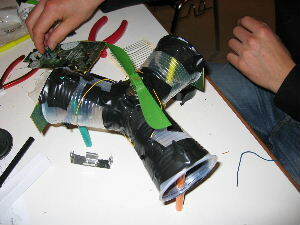 The concept stems from a project I did in elementary school with simple parts and battery power. 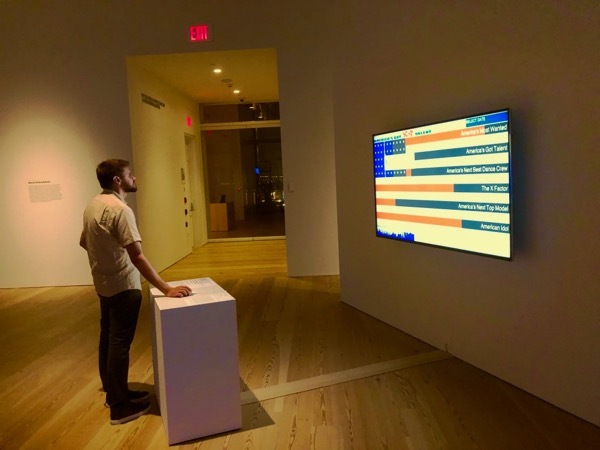 If you can create something compelling with simple means, then you have more justification to use complicated means. 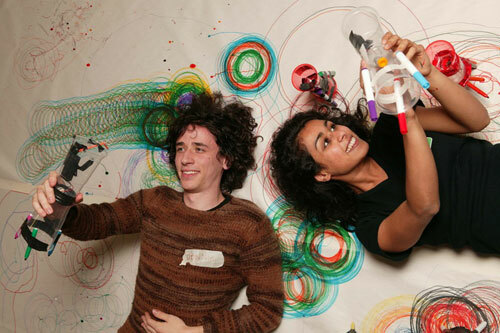 Images from Drawbot Workshop at DUMBO Arts Festival, 2011. Drawbot Workshop at the Ark, Dublin, Ireland, August 11-13, 2004. 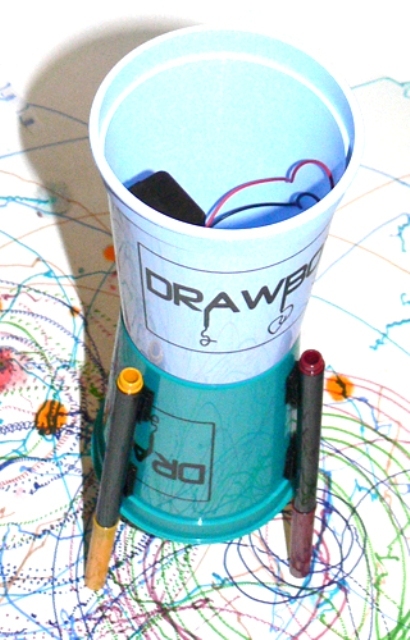 Picture of Drawbot for sale from Sheek Geek. Pictures from Drawbot workshop at “Artbots 2004” at Mink Building, Harlem, NYC, 9/17-20/04. 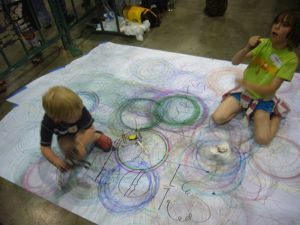 Drawbots at OFFF Cincinatti, Oct 27-28, 2011. 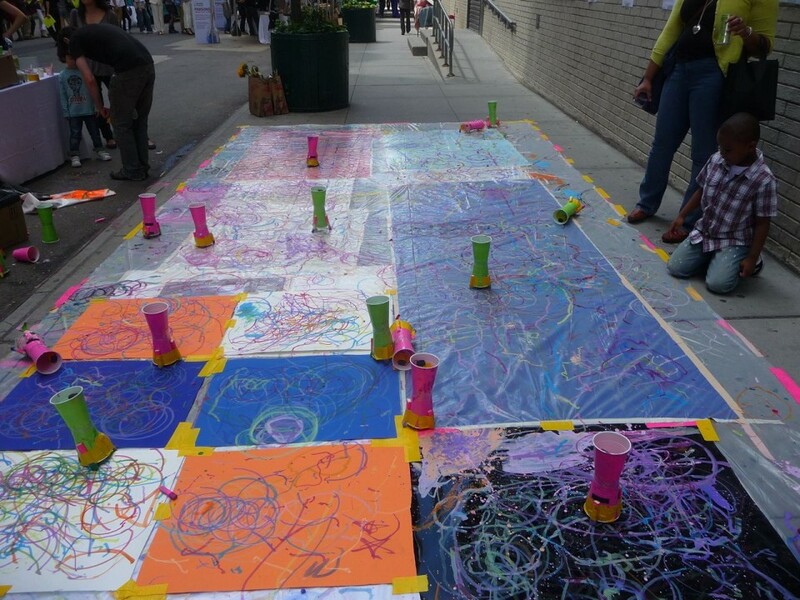 Drawbots at Maker Faire NYC, September 25, 2010. 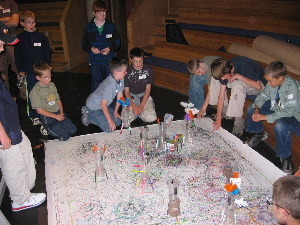 Kids Drawbots workshop at St. James National School, Stradbally, Ireland, April 23, 2008. Drawbot Workshop at Theatre Resource, May 25, 2009, Great Stony, Essex, UK. 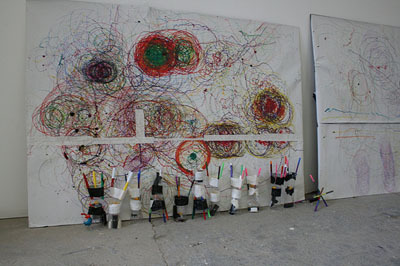 Drawbots on display at “Parsons Festival 2011” New York, NY, May 22, 2011.